As per our 'Start Date override' article, you'll now find that many job boards also support 'Salary override' as well. To see which of the boards you've chosen to post to support this override, simply hover over the 'speech bubble' icon to the right hand side of the field. 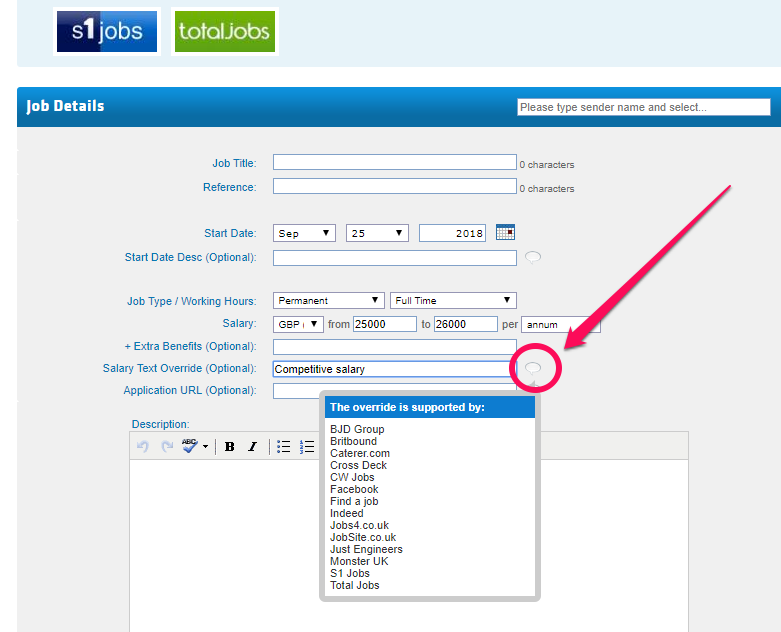 If the field is populated, then all boards listed within the pop-up will use your free-text salary override. Any not listed will default to the numerical salary you have provided. Many clients use this field to replace the the salary with a written description, such as 'Competitive', 'Benefits' or even 'Great package'..! Even if you are using a salary override, we'd still recommend entering the correct salary too. Any board that doesn't allow a salary override (or allow 'hide salary - yes/no') will show whatever you enter above. If the salary value you provide is Min '0' > Max '0', some boards will still use that for searching/banding purposes, and some may even reject the job outright as the value is below minimum wage.